While I was on vacation in Italy last year I got the chance to try some really amazing pizza! My favorite had to be the thin crust style pizza and that was nice and light and it had an almost crackery texture to it. 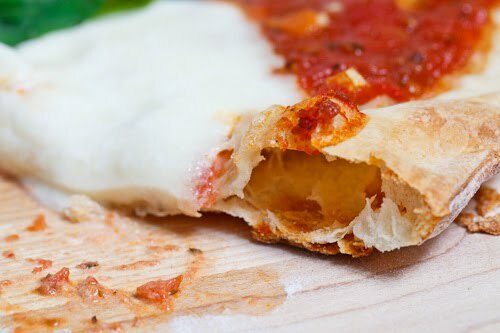 When I got back from Italy I went on a quest to duplicate that thin crust style pizza at home and after trying a bunch of recipes I settled on this thin crust pizza dough from PizzaMaking.com that gave me the best results. you to let the dough sit for 24 hours so you need to plan on that when on making a pizza. This dough has a really low water to flour ratio which means that you pretty much need to mix the dough in a food processor and even then, the dough is going to be very dry. In fact the dough will be more like crumbs but as long as you can form it into a ball then everything is ok. After sitting for the 24 hours the dough will not have risen very much but it will now have a more dough like consistency. The dough will be a little hard to work with but you want to roll it out as thinly as possible. To keep the dough from puffing up like a pita, I like to perforate it with a fork a few times. You then bake the pizza crust in a 500F oven until it just starts to turn a light golden brown. This pre-baking helps ensure that the crust will be nice and crispy even under the toppings. Once you are done with the pre-baking you can top the pizza with your favourite toppings and then it is back into the oven for its final baking. Now that I have my thin crust pizza dough recipe, it is time to start experimenting with some toppings! Mix the water, oil, yeast and sugar in a small bowl. Mix everything in a food processor until it starts to from small crumbs. Press the crumbs together to form a ball. Place the ball in a bowl, cover and let it rise for 24 hours. Roll the dough out very thinly on a lightly floured surface. Poke the dough with a fork all over. Place the dough on a pan and bake in a preheated 500F/260C oven until it just starts to turn golden brown, about 4 minutes. Pull the pizza out of the oven and top with the toppings. Bake in the 500F/260C oven until the edges are golden brown and the cheese has melted, about 5 minutes. Light, airy, thin dough is my favorite kind of pizza crust, so I'm excited to try this recipe! Thanks, Kevin. Bookmarked! Thanks!!! =) I just did a post on pizza as well! Always looking for good pizza dough recipes and hav eyet to find hte right thin crust recipe. Perhaps this will be it! Looks just right in the photos. Thanks for this post, Kevin. Your crust looks really great. I "stumbled" it so I can find it in the future. It's not as flaky and amazing looking as this one but it has tied over my thin crust needs for the time being. 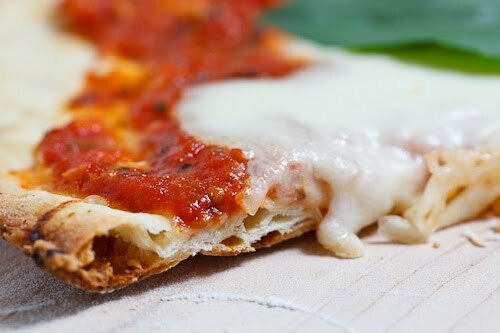 Oh yes, I love Italy's thin crust pizza too!! I've thought about it ever since i had my first taste, wishing I could make it myself. I don't have a food processor so not sure whether to attempt this recipe, but happy to try. Tremendo el aspecto de esta pizza, me encanta. I love thin crust, definitely my favorite. I know whatever you come up with will be inventive…..goat cheese please! Awesome! Congrats on conquering thin crust pizza. Enjoy the toppings experiments! I've experimented alot and have settled on a whole wheat dough that I can make ahead and keep in the freezer. Love the side shot of the dough. It looks gorgeous. I've been playing around with various dough recipes though I always seem to come back to one from The Figs Table Cookbook. American Pie is also a great resource for me, but the kind I've been most curious/excited about at the moment is the idea of doing a brioche dough crust which isaw in another cookbook. Yum! Fantastic! Thank you! I'm making pizza this week and will try this recipe. I've been searching for a thin pizza dough for ages, Thanks! Nice! Happy new year to all, and fingers crossed for a great 2011! I'm actually not the biggest thin crust fan but it definitely elicits a craving every once in a while. You nailed it! I've been trying to pick a recipe for thin crust pizza, as I've never tried to make it at home and it IS my favorite type of pizza. I will try the one you mentioned – and I agree with you, nothing beats a very simple topping, margherita is a winner! I recently tried an "overnight" dough for the first time like this, and it did turn out to be one of the best pizza crusts I had made in a while! Good gosh! I've been looking for a good thin pizza crust! I haven't had much luck, but this recipe looks very, very promising! Your photos have my mouth watering! I'm always fluctuating between thin crust and thick crust. This will be a great recipe to have on hand! The best thing from italy is pizza I think. There is good joke, Ianlian gentlemants think just on 2 thing, the second is pizza. Oooh lala! This looks like the perfect crispy dough. I will def try this one out next time I'm making pizza. Awesome, bookmarked and dough is waiting for 24hours for tomorrow nights meal. I don't suppose you'd consider publishing your measurements for recipes in grammes/ml etc? I think everyone loves thin crust pizzas. I am glad that it was invented. It is really great. This crust looks great.. I love making my own pizza crust, thanks so much! Would this recipe work with a pizza stone? This looks like an amazing dough, just the sort of thin almost cracker crisp kind I love. Thanks so much for explaining how to work with it. Can't wait to try it! I make margherita pizzas as a quick and easy dinner for myself all of the time. This looks like a delicious way to spice up my crust routine! Anonymous: I have not tried this dough on a pizza stone yet, but I imagine that it will work. I still need to pick up a pizza stone to try it out. Hi Kevin, was just wondering if you thought the dough would work with an all purpose flour and whole wheat flour blend, or would this make the dough too dense? Nicole: I don't think that I would try this recipe with regular whole wheat flour. If you have access to the white whole wheat flour, that might work but since I have not been able to find it, I have not tried it yet. make it hold together and it did not give the same results. Love your blog BUT I tried this recipe 3 different times with disastrous results. Every time the dough turns out dry and crumbly – like a pile of dustballs. It won't hold together when I try to roll it out (after resting for 24 hours). Any ideas? Add more water? Kevin: This dough is definitely a dry one but it should just hold together in a ball when you pull it out of the food processor and as it sits the moisture will spread out. By the time that you pull it out 24 hours later it should be a dough that you can roll. Some ideas: Try processing it a bit more in the food processor to make sure that the water is well distributed. You can try adding an extra tablespoon of water if absolutely needed. Make sure that when you are measuring the flour that it is light and fluffy rather than packed, you can sift it to make sure that it is. Are you at a high altitude? That can change baking parameters. Hi Kevin- this might be a stupid question, but where do you let it "rest" for 24 hours?? on the countertop or in the fridge?? Anonymous: Not at all; let it rest on the counter for the 24 hours. Canned't we just find a perfect crust out of a can ? I'm a total failure at dough-making. LOL. I might be late to the party, but have tried your thin crust dough a few times now (don't know if you have seen the other products – wine/vodka – but we call it "skinny girl pizza") anyways, for those suffering from dry crumbing dough, a couple of ideas (1) add one 1/2 T-sp of high gluten flour (2) coat with olive/veg oil before letting it rest, and (3) let it rest 24 hrs in the oven with the oven light on. Thanks for keeping this posted…it sure helped! Love this recipe. Easy to make in a bread machine. Lite and thin crust.